While maybe not quite as well-known as Rome or Florence, northern Italy holds its own treasures. The canals of Venice, the rugged Dolomite mountains and the famous lakes (such as Lake Como) are just some of the amazing finds here. 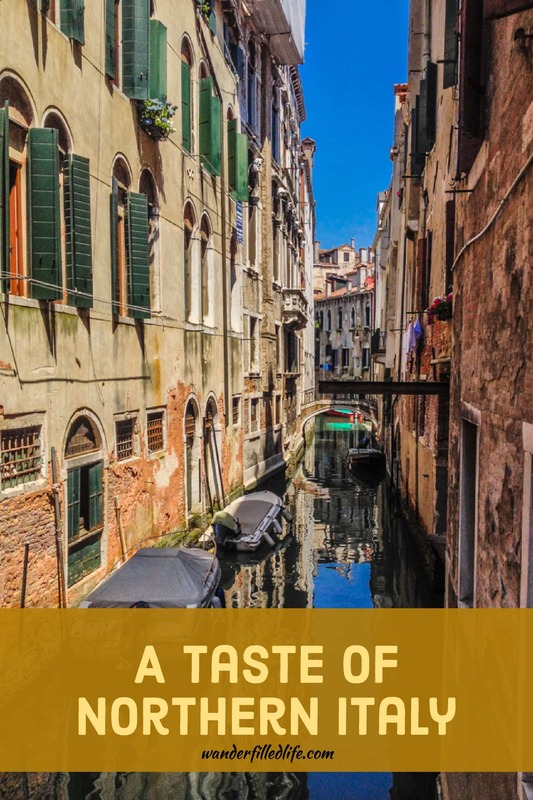 For most folks, Venice is THE city to visit in northern Italy. And we certainly agree. Venice may not have the same historical treasures or art that Rome and Florence house, but the treasures it does have are interesting and unique. What we liked most about Venice: no cars (because there is too much water)! What we liked least about Venice: too many tourists. While not quite as bad as Rome, there are still millions of tourists each year…and a population of only about 60,000. 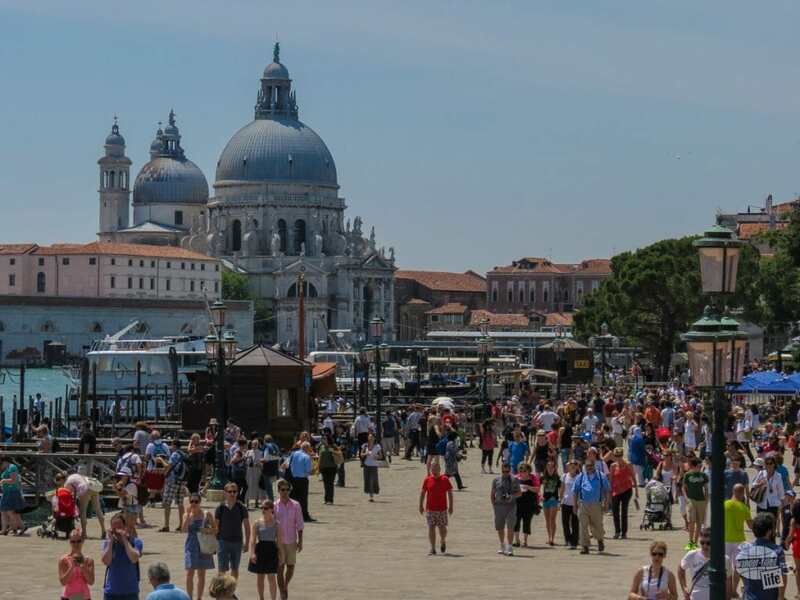 Venice can be crowded, especially in the summertime. After a lazy morning at the Hilton Garden Inn in Mestre, we made our way into the city via the city bus. As there are no cars allowed in town, you’ll need to be prepared to walk or take a water taxi most everywhere. The city itself really is the biggest attraction. We spent the afternoon wandering the streets and admiring the buildings, canals, and people. The maps are pretty much useless as the streets are really just a maze – turn down the wrong one and you’ll reach a dead end. I don’t think its possible to map it all out perfectly – it’s just too crazy. That’s part of the fun though! One thing you learn quickly about Italy, and many other European countries, is they like their city squares! Piazza San Marco (St. Mark’s Square) is the main square in Venice. On the square, you will find St. Mark’s Basilica. We admired the church building but ended up not going in. There are absolutely no bags allowed inside, which we didn’t realize until we were at the door. Yes, there are signs that luggage and “rucksacks” have to be checked, but we didn’t know that meant small, purse-sized backpacks too. We had already stood in line (yes, it moves fairly quickly, but a line is a line) and really just didn’t want to deal with it again. We also missed the Frari Church – the first time we got there, right around lunch, they were closed for an hour (no explanation, just closed); then when we went back later they had randomly closed early (of course about 5 minutes before we arrived), again with no explanation. It would have been nice if they had posted the early closing sooner, but oh well. We try not to get upset when a church is closed – it is, after all, a church, not just a tourist site! 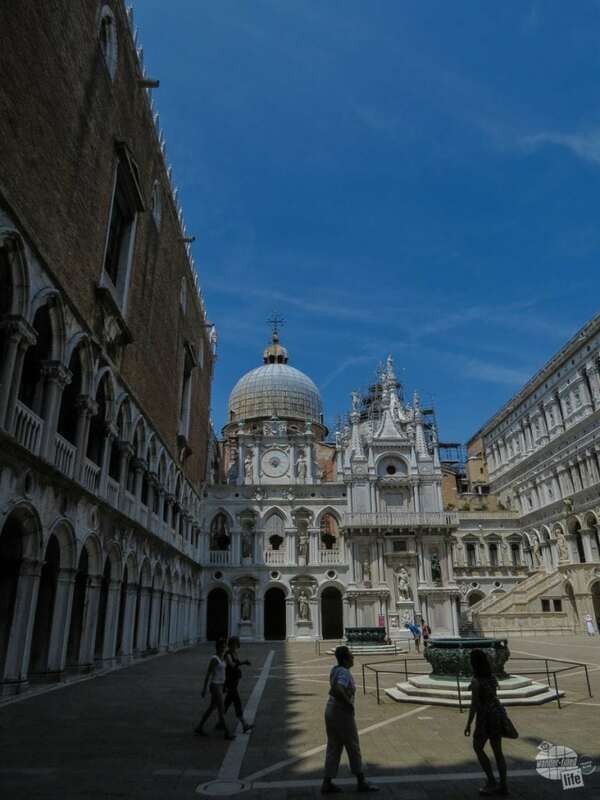 The Doge’s Palace is one attraction in Venice that you don’t want to miss! It was basically the home/capital offices of the kings of the Venetian empire back in the day. It houses all the “opulence” of the times – and also the prison! There was very ornate artwork (folks were flashy way back when) and some really cool armor and weapons! We thoroughly enjoyed a visit to the Doge’s Palace on both of our trips to Venice. Even on the second visit, it was spectacular and interesting! Of course, we also crossed the Grand Canal at the Rialto Bridge, which is nearly impossible to avoid! The Rialto is the main bridge across the Grand Canal and was full of tourists trying to take pictures. We did not take a gondola ride…at the time, we felt it just was not worth the money. But we did see lots of gondolas, water taxis, water buses, and other boats! The Bridge of Sighs connected the Doge’s Palace with the prison. It is called the bridge of sighs because you could hear the moans of the prisoners as you paddled by. Overall, we liked that Venice is not your typical city – it is, after all, built in the middle of the water! We liked the fact that you really just have to put the map down and hope for the best. But, in the end, a few hours of wandering was all it took to satisfy our Venetian desires! Pro tip: On our 2017 visit to Venice, we made a point to do a gondola ride. It was with a group which cut the costs, but it was an outstanding experience. Our recommendation: spend the money, despite how much it costs, and do the gondola ride. It was truly magical. Also, we saw a glass blowing exhibition while we were there in 2017. Wow! That was really cool! Finally, a non-touristy town! After a somewhat stressful morning of travel, we made it to Trento, just south of the Dolomites, which is a mountain area with strong German/Austrian influence. Our hotel, the Hotel America, was small and quiet, just the way we like it! There isn’t much to do here, which was refreshing. Our visit started with a cable car ride up the mountain, then we “hiked” down. We thought it was an actual hike, on a trail, but either we missed the signs or got some bad information because we ended up walking on the road for most of it. There were some great views up on the mountain, though, so we can’t complain too much! 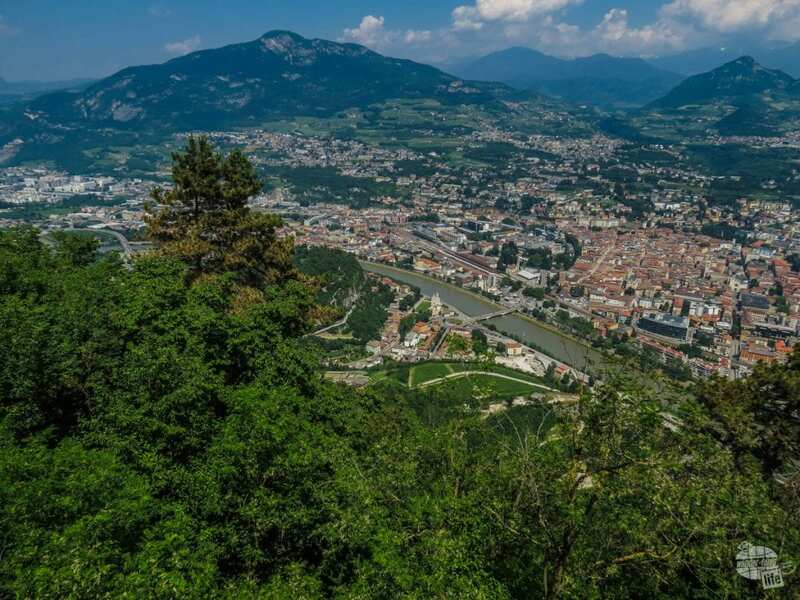 The “hike” we took had great views of Trento and the surrounding mountains. The afternoon was very quiet – very few people out on the streets and very few restaurants and shops were even open. There was a bit more action when we went to dinner… just enough to let us know that we weren’t in a deserted town, but not enough to be annoying! Dinner was great. Grant found some good local beer and we finally got a large plate of meat… more than just a little ham on a sandwich or pizza… at a local German-style brewery/restaurant. 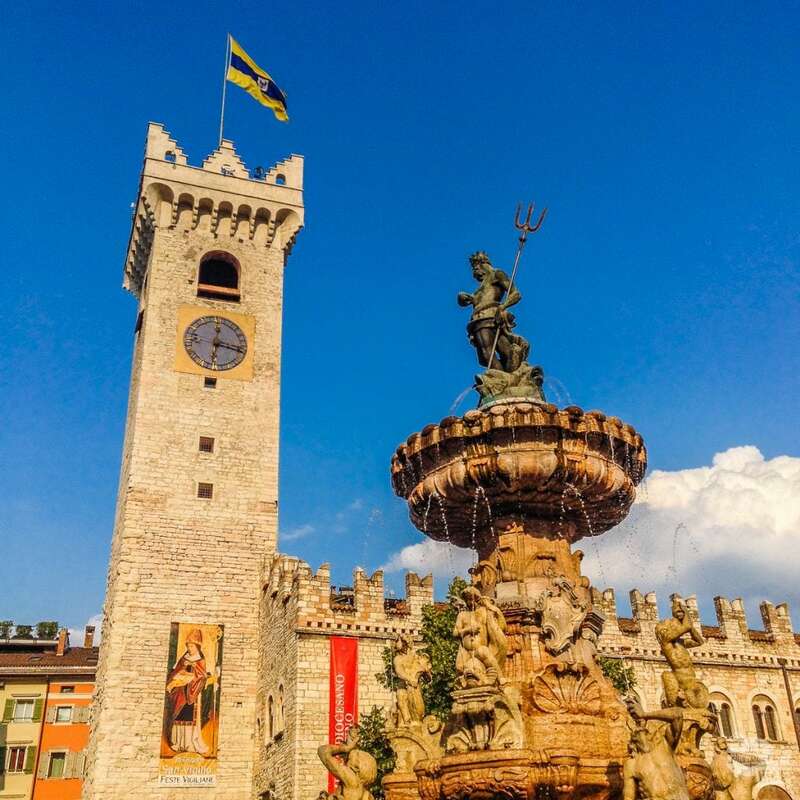 Trento was a nice, clean and relaxing city, but there just wasn’t enough here to keep us interested for long. We intended to visit the town of Bolzano. There’s not much to do there, but it sounded like an interesting town up in the Dolomites and is where the Otzi, the “Iceman” is displayed. Otzi was discovered in 1991 by some hikers on a melting glacier; the mummified body was eventually determined to be over 5,300 years old! Unfortunately, the museum was closed on the day we were looking to visit, so we scratched that off our itinerary for this trip and headed on. The train to Milan was uneventful and we enjoyed another trip through some beautiful scenery. The subway in Milan was a bit interesting, but we finally made it to the hotel. As you might guess, hotel prices are pretty steep here, so ours was kind of in the middle of nowhere. It was a nice hotel (good ole Hilton DoubleTree) but the lack of easily accessible transportation kept us in the hotel for the night. 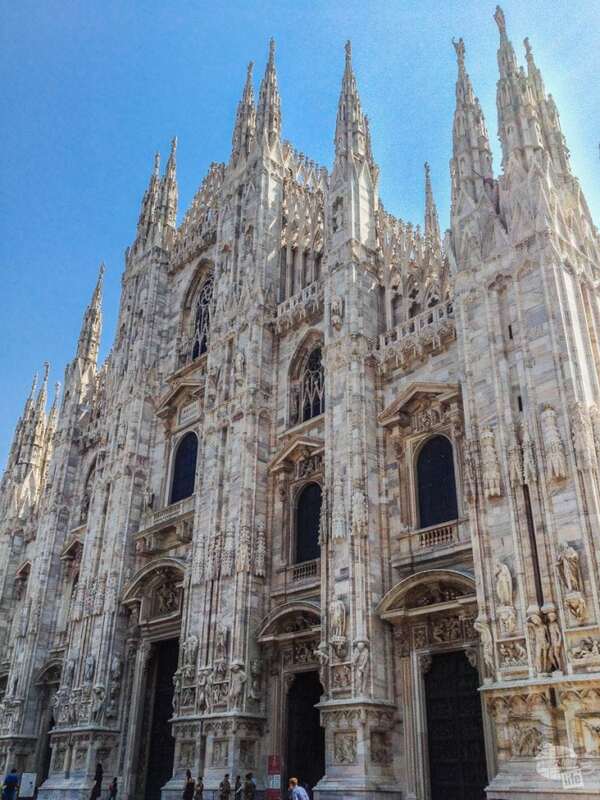 We toured Milan the following morning, which really did not take long. The main attraction is the Duomo or Milan Cathedral, the largest in Italy (remember, the Vatican City is its own country). Just like most of the others, it was very impressive…so ornate, inside and out, it’s hard to believe its real – even though you’re right there looking at it! Leonardo da Vinci’s “The Last Supper” is on display in Milan, but you have to have a reservation and, apparently, they sell out weeks in advance. The tickets are put on sale without notice so you really have to have some luck on your side to be able to see it. That was all we really cared about in Milan, so after touring the Duomo, we headed back to the train station. Our “free” visit only cost us €10 to store our bags and €6 for the metro, but it was worth it….and it was way too hot to walk around and look at things we really weren’t that interested in! Milan was an interesting town, but in hindsight, we probably could have skipped it. 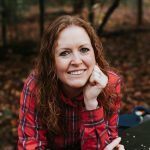 Sure, the church is amazing, but so are many others. Next stop: Varenna, on the shores of Lake Como. 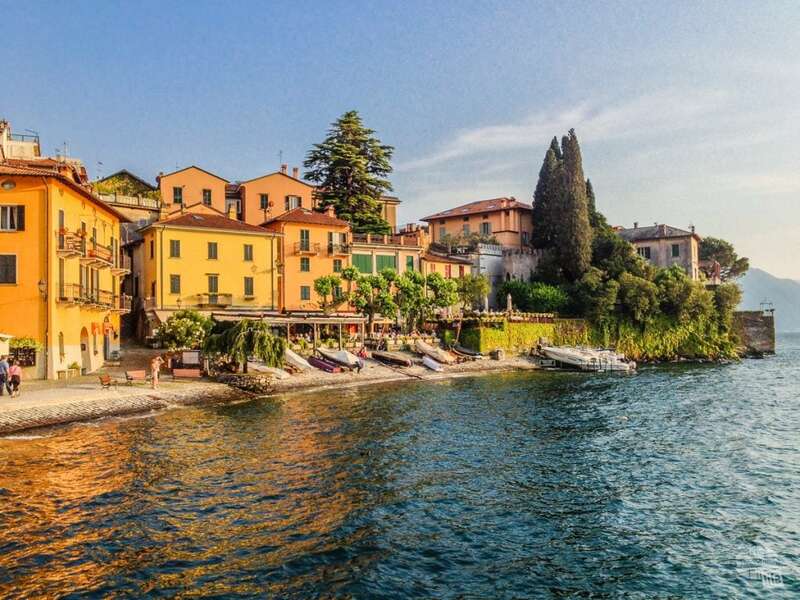 Varenna is only about an hour from Milan on the train, but it is completely different! This lake area is full of lots of small towns with not much to do other than relax and enjoy the scenery. 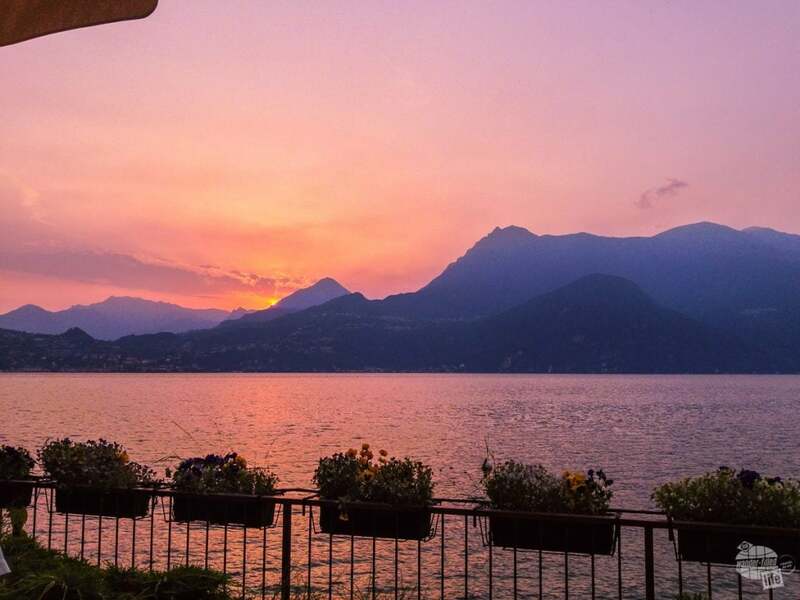 Once in Varenna, we settled in at the Hotel Montecodeno. We started our visit with a hike up the mountain to Castello di Vezio, an old castle which houses several owls, falcons, and other birds of prey. They do a falconry exhibit every day and the views are amazing! 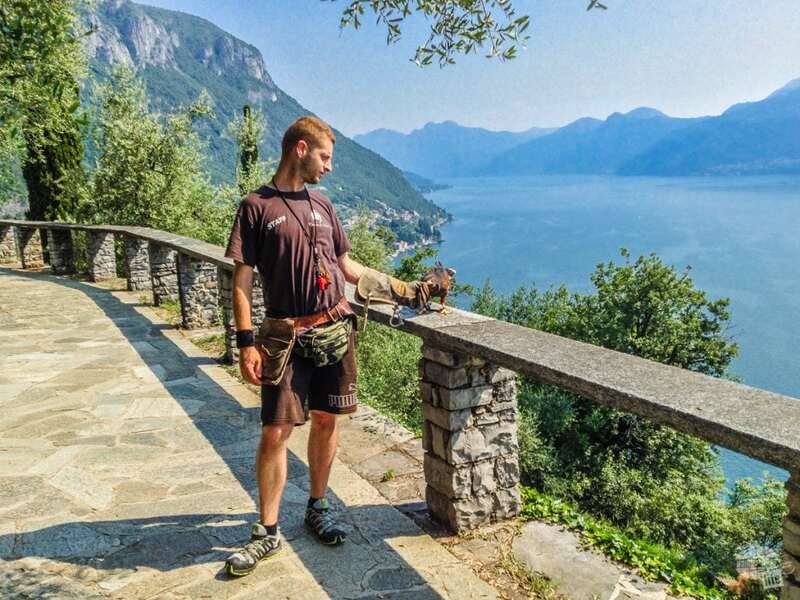 The castle above Varenna offers falconry exhibitions and fantastic views! We didn’t get to see much…it was very hot and they couldn’t keep the birds out as long as usual. They had one Harris Hawk out that the guy let fly around, and we got to take some pictures. We didn’t get much info and didn’t see much, but the bird was pretty and it was cool! There was a great view of the lake and the town from way up on the mountain – definitely worth the short, but steep climb! The next day, we took the ferry across the lake and did a hike by a river. It was nice – a little difficult to get to, but we enjoyed it. Most of it was fairly easy, except the fact that it was almost all uphill going out. There was one part of climbing over rocks with built-in steps and a handrail. Thankfully, that really wasn’t too bad, even for this scared-of-heights-gal! 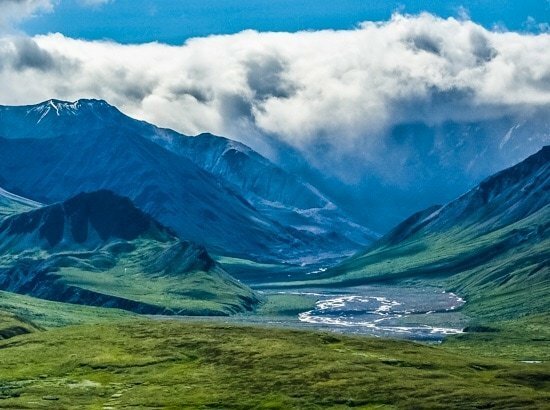 Apparently, they had a bunch of rain in this area in the spring and that is making it more humid than usual. The lake and mountains have been very hazy…reminiscent of the Smokey Mountains! 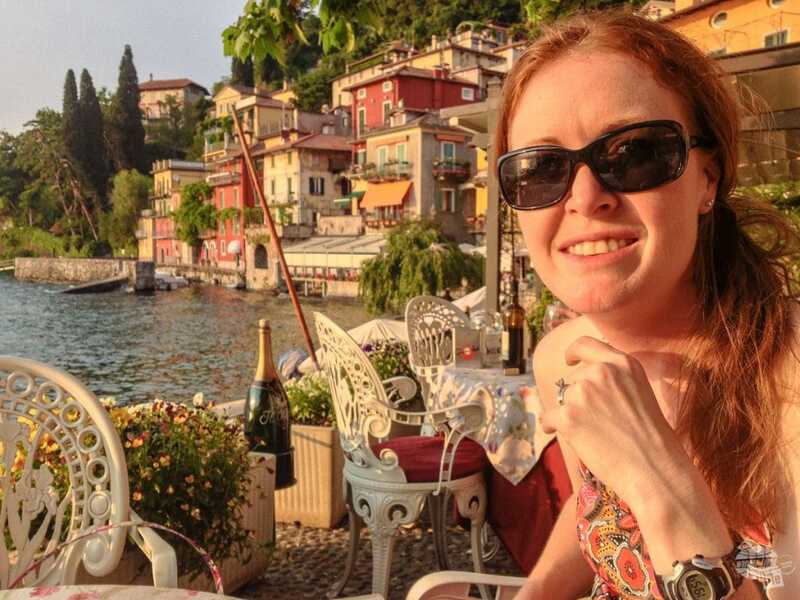 Bonnie enjoying dinner in Varenna. We enjoyed dinner on the lakeside both nights. This is a very small town, so it is very quiet and relaxing! There are a lot of tourists, but it doesn’t feel overly touristy, which is nice! No George Clooney sightings, but we enjoyed our stay here, none-the-less! 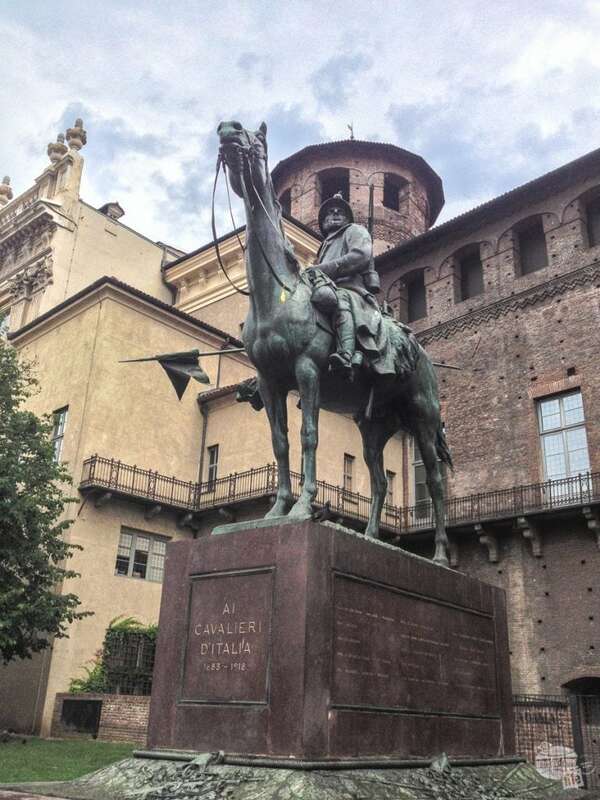 In Turin, we visited the Museum of the Shroud and the National Cinema Museum. The Shroud museum was really interesting! Regardless of what you think about its authenticity, the things they have done to interpret and preserve the Shroud are fairly spectacular. I didn’t know much going into the museum, other than the very basics. We started by watching a very informative video and reading several displays about the Shroud. The museum also houses a full-size replica. There is information on how they have used photographic negatives to help “read” the Shroud. The museum presented all the information very factually and scientifically. After that, we went to the National Cinema Museum. It was ok… not as good as we expected, but not horrible. It went through some of the histories of film, starting with shadow boxes and “flipbook” style animation, up to modern day. They had a few costumes & props from various movies. There was a large exhibit on Martin Scorsese, mostly pictures, scripts (& his notes), storyboards, letters, etc. 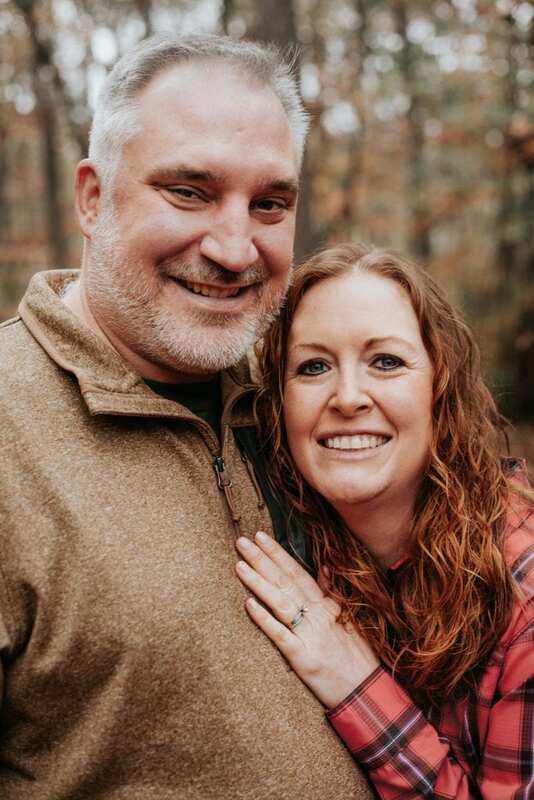 Our biggest gripe was that it wasn’t very well organized – we felt like we weren’t going through it in order and couldn’t figure out what the correct order was. That’s about it for Torino. We enjoyed our brief stay… the city was not too crazy and not too touristy – just how we like it! We really enjoyed this area of Italy, especially Venice and Lake Como, but understand why it isn’t as popular as some of the other regions. 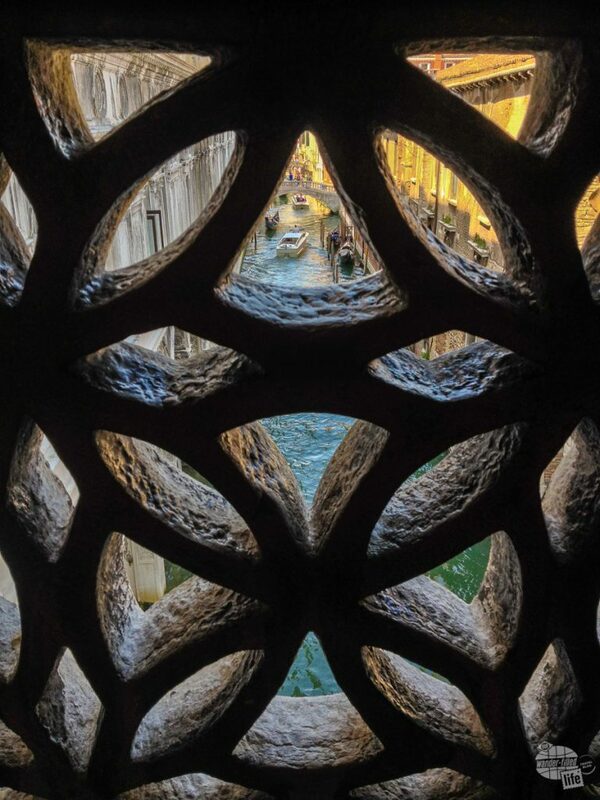 Venice is unique and, for many, a must-see city. But, if you have limited time in Italy, it can be a lot of travel for just a one or two day visit. Varenna and Lake Como are beautiful and very relaxing! We tend to enjoy the smaller cities because they just feel more authentic. While there were tourists, it wasn’t nearly as crowded as Venice or Rome. Being able to slow down and just enjoy everything around us was a real treat. 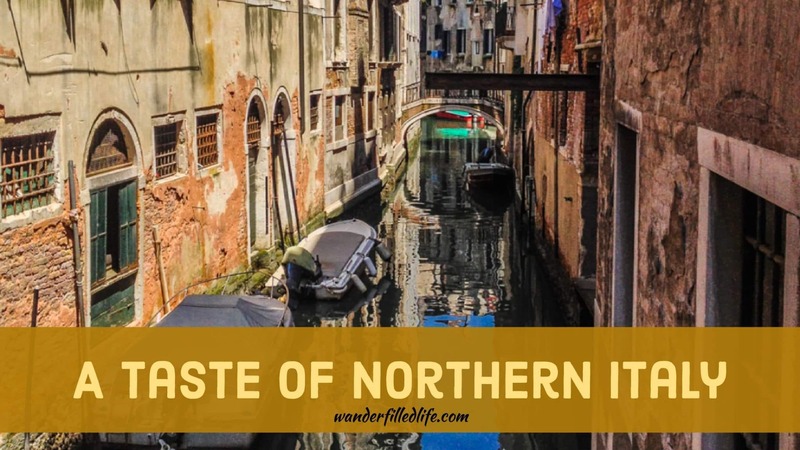 If you have several weeks and are trying to get a “big picture” view of Italy, we definitely suggest some of these Northern cities. Even if you only have a week, it is still possible to include Venice. Check out this article on how to visit Venice, Florence and Rome in just one week!